3 Bedroom Detached House For Sale in Sheffield for Guide Price £210,000. 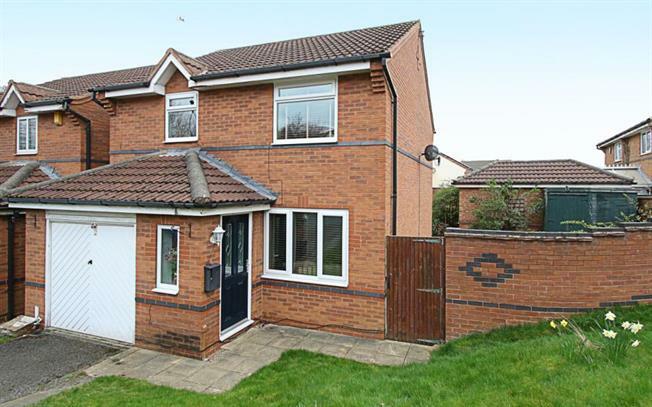 Offered for sale on the sought after Heathlands development in Halfway is this well-appointed and presented three bedroom detached family home positioned on an enviable corner plot having front, side and rear gardens, offering the potential to extend subject to necessary planning consents. Available to market having NO ONWARD CHAIN INVOLVED and benefits from a driveway providing off road parking with access to a single integral Garage. Positioned within this sought after residential development enjoying the many facilities such as a local recreational park, shops, schools, public transport & easy access to Crystal Peaks Shopping Centre, Drake House Retail Park & Rother Valley Country Park, this fantastic property must be viewed internally to be fully appreciated. In brief the accommodation comprises; to the ground floor the entrance porch leading into the living Room with stairs rising to the first floor landing and being open plan to the dining room where French style doors access the rear garden. Further from the dining room a fitted Kitchen has a range of wall and base units with integrated appliances to include gas hob, electric oven and extractor fan along with space and plumbing for an automatic washing machine and a rear facing entrance door leads out to the rear garden. To the first floor the Master Bedroom has an en-suite Shower room, three further bedrooms and the family Bathroom. Externally: To the front of the property is the driveway leading to the integral Garage, front lawned garden and a side gate leads to an enclosed walled side garden/sun terraced being flagged and stocked with garden shed, leading round to the rear is a lawned and stocked fully enclosed garden with flagged patio area. Halfway is a sought after area for buyers of all ages due to its excellent amenities, Sheffield Supertram networks, Schools and its close proximity to Crystal Peaks Shopping Centre. The area boasts excellent local eateries and gastro style restaurants in the nearby villages, superb local walks on the Pennine trail and outdoor pursuits at Rother Valley Country Park. Ideally situated for links to the M1 motorway networks and Sheffield City Centre.